Yeah! Yesterday marked one of the brighter spots in my pathetic career as a music journalist for sly-fi.com. 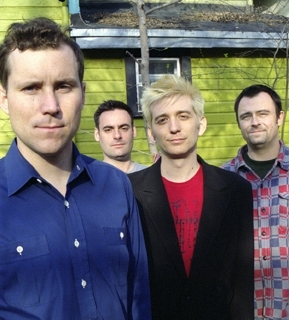 I got to do an interview with Stephen Carroll of The Weakerthans, famed sons of Winnipeg, Manitoba, Canada. Too bad I had prepared an interview with John K. Samson, the singer responsible for the great poetic lyrics that are a huge part of what makes The Weakerthans everyone’s favorite band. Here’s a short list of the musicians in attendance: Markus Wiebusch (But Alive, Kettcar), Reimer (Kettcar), Nagel (Muff Potter), Walter Schreifels (Gorilla Biscuits, Rival Schools), Thees (Tomte), Bernd (Beatsteaks), Nino (Virgina Jetzt!) and many more. Well, when I found out I couldn’t use three quarters of my questions I was a little irritated, but Stephen turned out to be very nice and patient with me and we ended up talking about Curling which seems to be Winnipeg’s number one winter pastime next to ice hockey, which we also talked about. Especially the dark side of professional sports in North America (i.e. Business). Because the Manitoba market is too small and unattractive the Winnipeg Jets of the NHL got sold to Phoenix, Arizona of all places not well suited to foster an ice hockey franchise. Voilà the Phoenix Coyotes. So now all the Manitobans have is their Curling league. Both Stephen and John play in those regional championships and one of the best songs on the new album “Reunion Tour” is called “Tournament of Hearts” and is about Curling. They even use Curling symbols on their merchandise which is traded fairly. After all, The Weakerthans are a poltically correct band. And they’re great live. I don’t know how but those one and a half hours really went by in a glimpse and then it was all over. Bass player John P. Sutton and guitarist Stephen did some great heavy metal poses and the overall on stage atmosphere was joyful. John K. Samson revealed he had burnt his hand with coffee (“That german coffee sure is hot”) and got laughed at. And now for the good news: You will be able to see the whole show and my ill-prepared interview on sly-fi.com in a week or so. Now how’s that?